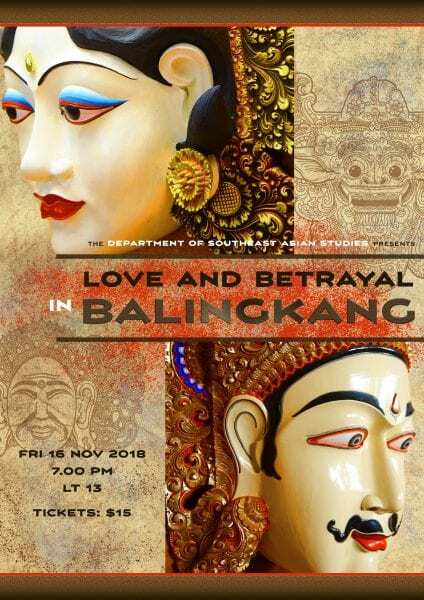 The Department of Southeast Asian Studies presents “Love and Betrayal in Balingkang“, The story of King Sri Jayapangus and his Chinese wife, performed by students of SE3230 Seen and Unseen: Explorations in Balinese Theatre. Prembon was first performed in Bali in 1942 and combines some of the quintessential elements of Bali’s most famous theatrical genres – topeng (masked drama), gambuh (classical drama) and arja (sung opera). Prembon performances narrate stories from Balinese history and include dance, singing, narration, drama and comedy. All Prembon performances are accompanied by a full Balinese gamelan ensemble. The story is taken from the Babad Bali/Dalem – the chronicles of the Kings of Bali. It tells of King Sri Jaya Pangus (1181-1269), ruler of Pejeng (currently a small town near Ubud) who was from the Warmadewa dynasty. He had fallen in love with Kang Ching Wie, the daughter of the Subandar Cina (Chinese port administrator). Their marriage was opposed by the court priest, Begawan Siwagana who believed that Sri Jaya Pangus was going against the rules of the royal house by marrying a non-Hindu non-Balinese. Angered by Sri Jaya Pangus’ stubborn refusal to call off the marriage, he cursed the kingdom with heavy rain and floods. Sri Jaya Pangus decides to leave Pejeng and establish his own kingdom called Balingkang (named after Bali + Kang, his wife’s family name). Despite having been married for a long time, Kang Ching Wie did not produce children and Sri Jaya Pangus decided to meditate and seek help from the gods so his wife could conceive. He travelled up the slopes of the Mountain Batur. It was here that he met Dewi Danu, the goddess of Lake Batur. Sri Jaya Pangus fell in love with Dewi Danu, never telling her about Kang Ching Wie. Dewi Danu had a son with the king whom they named Mayadenawa. Kang Ching Wie waited patiently for her husband to return but he never did. She eventually decided to search for him on Mount Batur. When she found out that he was with Dewi Danu, Kang Ching Wie was devastated. Dewi Danu was angered at the betrayal she felt as Sri Jaya Pangus had never informed her of his wife. In a fit of anger, she made both Sri Jaya Pangus and Kang Ching Wie disappear from the face of the earth. The residents of Balingkang who loved their king and queen, made two giant puppets (barong landing) to remind themselves of their rulers. Performers: There will be musicians from Bali and dancers accompanying the NUS students in this 2 hour production. Tickets: Priced at $15 each at the official booth set up along the Central Library Walkway from 22 Oct – 26 Oct 2018. Tickets can also be purchased directly from A/P Irving Johnson.